We talked about the latest changes in Python and if we share the view on "offensive" words like master and slave (in short nobody seemed to agree). So I was also making a sarcastic statement about other terms and phrases that seem to be totally offensive when ripped out of context. And to absolutely no surprise this message was flagged. 5 times. Then someone seems to have removed the message manually as I was muted for 30 minutes. As past experiences also have shown people tend to simply press "valid" without even checking the context I suggest we change the way flags can be agreed on: You have to join the room and can validate or invalidate the flag there. Not from the outside but being forced to see the context first. It may be helpful to make a room owners' vote on such flags count for (much) more than a "normal" vote. Room Owners are the ones responsible for keeping the room "in line". They're familiar with the room's culture and are generally uniquely qualified to judge a chat flag's validity. Should valid flags be cancelled by ROs, then there's always the option to add a custom moderator flag, so the ROs can be corrected. Of course, this would require ROs to be able to see flags in their rooms, regardless of how much rep they have. There's a far less chance that something benign but questionable if taken out of context would be picked up, well, out of context. We basically had that spec written, and then .. some bad things happened in chat. A few situations where room owners and some very high rep users weren't only complacent when it came to allowing and encouraging pretty sketchy behavior, they were also actively working to cover it up. Had we implemented what we were considering, it's unlikely that this stuff would have surfaced, and ... that would have been really darn bad (TM). Since we've seen the worst anticipated behavior, we have to account for it, and that makes this a little hairy. We're open to ideas, for the most part we strike a pretty good balance with the system we have, but when it goes wrong (in either direction: stuff getting piled on that's benign, or awful stuff not getting flagged) it tends to go really wrong. Even the simplest idea like don't show flags out of the room on stuff written by 10k+ users breaks because we've seen 10k+ users actively try to cover bad things up. I think we're even open to putting additional work on employees here, but we can't count on someone being around 24/7, so there's always going to be some need for the system to just ask anyone it can find as a failover (at least). We're open to ideas that take the above into account. I've disliked how this works since the day we launched chat; we've just yet to come up with anything better that doesn't open the door for awful even wider. I saw that one live*. I now request that a moderator go restore that chat entry in its proper place in the transcript. That interface is bad. Need to show previous and next message by the same user at the absolute least. You will still get problems w/o half a page of transcript though. *I'm pretty sure I actually followed a transcript link in the short window it could be seen because I never joined the room. Not the answer you're looking for? 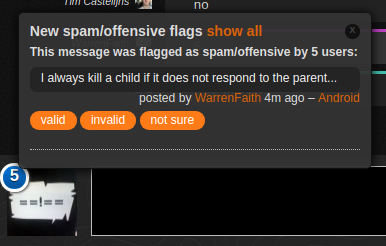 Browse other questions tagged discussion flags chat . How to invite users to a Stack Overflow chat group? Can unconstructive users be suspended on chat? How can I *safely* edit totally broken new user's question?